This premium goal is offered in 8'H x 24'W x 3'D x 9'B size only. 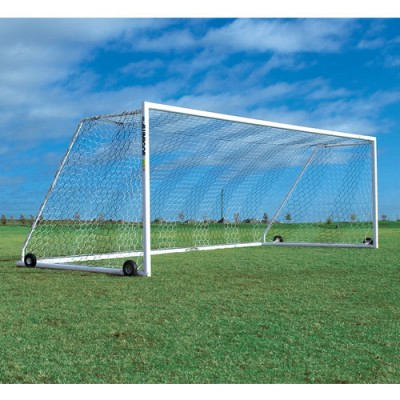 It meets NCAA, NFSHSA and FIFA specs and includes 4mm Black/White Hexagonal nets, ground anchors, built-in net clip tracks, clips and stainless steel hardware. Crossbars and posts are 4" round, powder-coated, custom aluminum extruded material for superior strength. Backstays are 2" round powder-coated aluminum and tig-welded corners are double reinforced. A 5 year limited warranty is included in this truly exceptional match. 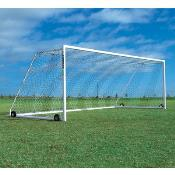 Soccer Goal (sold in pairs)- FREE NETS and GROUND ANCHORS are included. Flip-over wheels (4) are also included.